Males are dark brown with black “chevron” markings. Females are white with black “chevron” markings. Males have large feathery antennae. 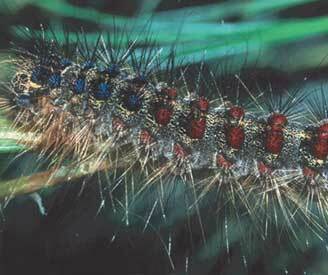 Larvae are dark colored and fuzzy with 5 pairs of blue spots. One year lifecycle. Prefers oak, aspen, willow, apple and crabapple, tamarack, white birch, witch hazel, and mountain ash but are found on over 300 species of trees. 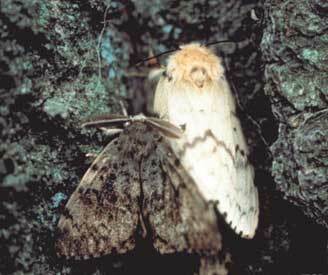 First introduced from Europe for silk production, and first found in Massachusetts in the late 1800’s. Spreads through the movement of nursery infested stock, movement of firewood, and on vehicles from infested areas. Shot holes in leaves and foliage stripped from trees. Declining trees from many years of damage. No current known infestations in Nebraska; sporadically found here as a hitchhiker. Currently found in several states in northeastern U.S. Learn more on the National Invasive Species Information Center website.